Joshua Ward was born in Guisborough, Cleveland where his father ran an alum business. Coming to London he worked with his brother William as a drysalter in Thames Street. In 1717 he stood and was elect4d MP for Marlborough. It was noticed that nobody had actually voted for him. More, the mayor's signature had been forged on the Return. Expelled forthwith, he was put, first, in the pillory and, second in prison. He then fled to France, remaining there for 16 years. He was convicted during this time as a fraudster for embezzling £70,000 from the Duke of Buckingham. Also, he probably picked up a little medical knowledge: inventing the medicines known as Ward's Pill and Ward's Drop. Pardoned by George II he returned to England in 1734 and embarked on medical practice, which brought him to public attention, enjoying both notoriety and fame. He seems to have been happy to encourage both. Ward is said to have opened a factory in Twickenham in 1736 for the manufacture of sulphuric acid. However, the earliest rating assessment for this enterprise was to his assistant, John White, described as “Chymist” in St Mary's Churchwardens' Accounts for 1743. The factory was somewhere along the north side of Heath Lane. The procedure, involving continuous production, ignited nitre, or saltpetre with sulphur and it produced an unpleasant smell, though very cheap acid. This smell permeated the air of neighbourhood, displeasing the gentry. The factory came to be known as the “Great Vitriol Works.” The description may have been a misnomer because Laetitia Hawkins, who came to live in Twickenham House on the south side of Heath Lane in 1760 described the premises as a “more humble dwelling opposite us.” The factory probably closed in 1749, following an action heard at Westminster Hall to forbid the pollution caused by the process. The Churchwardens' Accounts for 1749 list Francis Lloyd in Ward's house. Admiral Thomas Fox had settled in Twickenham that year and stood, somewhat roughly handled, as a witness for the prosecution in the Action. Later, in 1744 during Pope's last illness Bolingbroke wrote to Lord Marchmont that he “should be for letting Ward see Pope, and prescribe to him.” But it does not appear that Ward actually came to the Villa. Ward was unmarried. He died on 21 December 1761 and, on 26 December was buried in Poets' Corner in Westminster Abbey; his only qualification for such an august site being residence in the parish. His grave is unmarked: there is no memorial. He does not appear ever to have lived in Twickenham. 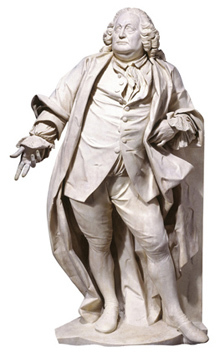 A marble statue of the man, the work of Augustino Carlini, once stood in the Royal Society of Arts and is now to be seen in the Victoria and Albert Museum. This statue was apparently commissioned by Ward's great-nephew Ralph Ward who had been elected a member in 1762. He presented the statue to the Society in 1792, something which may have given rise to the belief the Joshua had been a member of the Society. This does not appear to have been the case.